If you’re new to growing sempervivums (commonly called hens and chickens)… the flowers, and especially the flower stalks, can come as somewhat of a shock. If you know what to look for, it is usually obvious when a rosette is about to flower… first it becomes larger than the surrounding rosettes, then a fleshy stalk starts to grow out of the center of the rosette. Eventually clusters of small buds form at the top of the stalk. Sempervivums are monocarpic, which means that after the flowers open and fade, the original rosette dies. 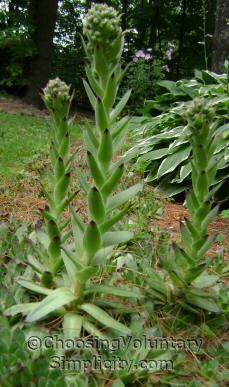 The flower stalks can become very tall, depending on the variety of sempervivum, and although the flowers are quite beautiful, the flower stalks are not. 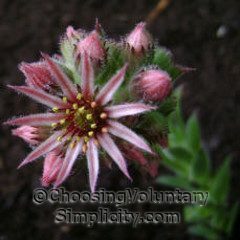 Most flowers will be shades of pink or red, although some sempervivum varieties produce yellow flowers. The flowers are star-shaped and can have from six or eight up to sixteen petals. 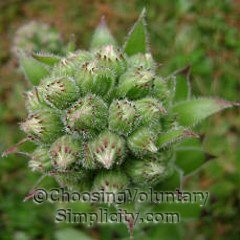 The flower stalks are fleshy and grow to be very tall. Once the buds form, the flower stalks tower over the original rosette and often flop over because the buds are so heavy. Under optimum conditions, the flowers will produce a fruit that contains fertile seeds. These seeds can be germinated, although it is unlikely that the seedlings will be exactly like the parent plant. If you want to try saving seeds, let the fruit ripen and dry before crushing the fruit and sifting out the seeds. Germination rates will be higher if the seed is stored in the refrigerator for several weeks before planting, or planted outside in the fall so the seeds will experience the winter’s cold temperatures. I’ve had great success growing Sempervivum from seed (also Jovibarba, but that’s another story!). I haven’t grown my own collected seed yet, but I’ve bought some online and was amazed at the many variations. The different colours and forms don’t show up immediately, but in a few months you can see them starting to colour up, especially as the cooler weather of Autumn arrives. Lovely to have such a nice obsession! I have never had my sempervivum’s flower until this year when 2 of them did. The flower stalks were big and fleshy and looked like the ones in your photograph but the buds never opened into flowers. Eventually the whole flower stalks dried up and I threw them away. I bought some sempervivum seeds on Amazon and had very little luck with growing any seedlings. I did manage to grow about six and later three of those died but I do have three succulents that I grew from seed. They’re still very young and they all look about the same. I don’t know if they will develop into something different of if they *are* all the same. I plan to try again another year.